If you are looking for something innovative from your next smart gadget then Samsung Galaxy Note is the perfect choice for you. Samsung Galaxy Note features a 5.3" HD 1280x800 pixels Super AMOLED touchscreen of 285ppi which is the largest and highest quality display available in any primary mobile device of today. The high resolution display ensures that PowerPoint presentations, web-pages, news apps and e-books can be viewed comfortably with minimal scrolling or zooming. Galaxy Note is powered by a 1.4 GHz dual-core processor with 1GB of RAM and runs on Android 2.3 Gingerbread. The device comes with a stylus that works with dedicated apps like S Planner, S Memo, etc. The GALAXY Note’s advanced pen input functionality is combined with the full touch screen to create a new input experience. Galaxy Note features an 8 MP Autofocus camera with LED flash and 1080p video recording capability. The camera features include Geo-tagging, touch focus, face and smile detection & image stabilization. The device also has a front-facing 2 MP camera for video calls. 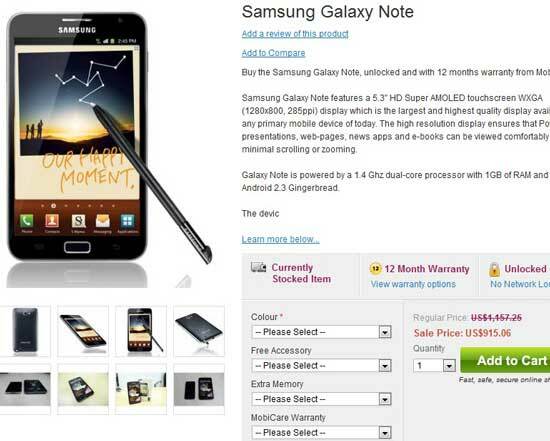 Samsung Galaxy Note is already available in Australia via Mobicity before US or UK release. They are offering unlocked contract free Galaxy Note for $915 at this moment with 12 months warranty. You can also get a free car charger with every Galaxy Note in Australia. If you want to buy your Galaxy Note with 2 years of extended warranty then you have to cost $63 more.